"These guys look more impressive then the raiders from Fallout." 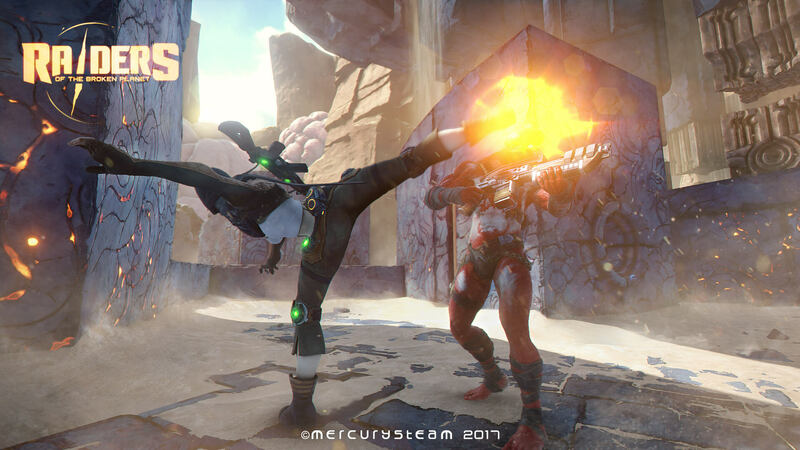 MercurySteam has released their first trailer for their upcoming game just over a year after it being announced. Looking at the trailer we can see how nonlinear the story will be. The trailer starts by showing the co-op aspects of the game but then quickly shifts to a PvP showcase. The game is going to give us the choice to be a hero or a villain. Honestly though isn't that just a matter of perspective? Four different campaigns will be available that can be played in any order and they are Alien Myths, Wardog Fury, Hades Betrayal and Council Apocalypse. Now at release only Alien Myths will be playable and the others will release throughout the year. Also according to the developers raidersofthebrokenplanet.com/c... the story of Alien Myths is the following, "The Raiders will explore the Broken Planet in search of the legendary Protectors. With their help, Harec hopes to drive out the human invaders forever. On their adventure, the Raiders will face cruel enemies, secure unexpected alliances and unravel the mistery of a mythical, antagonistic power that is conspiring against them from the shadows." There is no set release date for this game but it is said to be coming in the next couple of months.